iSlate is said to be 1.5x larger than iPhone. The long-dreamed-about iSlate is once again a hot topic, as fresh rumors claim that Apple has been working on such a device for 18 months and that it may hit the market sometime in 2008. While some question the likelihood or even usefulness of such a device, the iSlate and its bigger display have at least one clear advantage over the iPhone — it would be ideally suited for reading documents like web pages or ebooks, while the iPhone is a compromise requiring changes in zoom or display orientation. 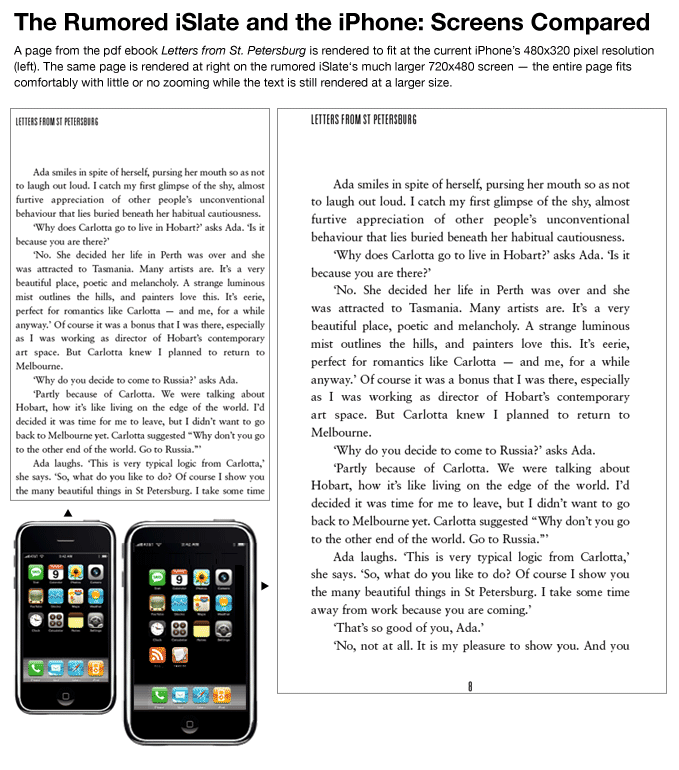 In the simulated displays below, a page from the pdf ebook Letters from St. Petersburg is rendered to fit on the current iPhone’s 480×320 pixel resolution (left). Even zoomed in to fit the full width of the display in portrait orientation, the text is small and difficult to read. The same page is rendered at right on the rumored iSlate‘s much larger 720×480 screen — the entire page fits comfortably with room for additional zooming, while the text is already rendered at a more readable size. This display spec, if true, supports speculation that the iSlate would be the opening salvo of an Apple campaign to transform books and reading, just as it has already done for music. Irving, I’ve been playing around with different trim sizes for the books that I design, too, to see if there is an optimal size that translates well on both large and small displays. I’m definitely curious to see your choices, too. Love your graphics, display of the iPhone sized next to the iSlate was great. Haven’t seen that before.